One of the key questions Christians need to ask – as we seek to communicate the Good News of Jesus Christ – is where is the market place? One of the things that we have found very helpful is what we call Quench – coffee shop evangelism. Here is a talk on the subject I gave at the Forum of Christian Leaders in Poland. As I type this I am sitting in a coffee shop – one which we will be using later in the week for CreationFest. There are numerous ways and opportunities for us to meet with people and communicate the Gospel. You can’t talk to people about Jesus unless you are talking to people. I recall one of the first American missionaries who came to help us in Dundee…I told him to forget all his programmes and training and instead said to him that by the end of the year if the staff in every coffee shop on the Perth road did not know him by name, he would be fired! “You want me to drink coffee for Jesus? Thats my ideal job!” was his somewhat enthusiastic response! The people of Europe are more open to the gospel now than in the last twenty-five to thirty years, but the church is less prepared than ever before to proclaim the gospel in today’s European culture. Quench: Café Culture Evangelism desires to change that trend – not as a new concept, a new evangelism programme, or another gimmick guaranteed to rejuvenate evangelistic zeal. It is an approach to people, urging the church to go outside her four walls and into the market place to share the gospel in a natural setting. With Quench, there is no one size fits all approach. The principles for café culture evangelism are firm, but they need to be adapted for each culture. 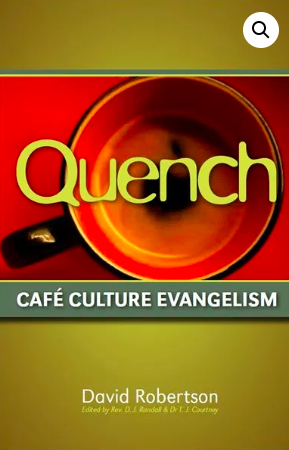 This book is designed to help people of various cultures think through the issues and nuances of their own situation, as they determine how best to utilize Quench: Café Culture Evangelism. You are so correct. We have to go to the people, where they are. Thank you for the reminder, and I shared your post on Facebook.